Starting this week, MARTA representatives will go door-to-door visiting businesses along the Clifton Corridor to provide updates about one of the region’s most congested areas and one of the largest job centers in the metro area. Upon completion, the Clifton Corridor Transit Initiative will provide a direct transit link between the Lindbergh Center Station in the City of Atlanta and the Avondale Station in DeKalb County. MARTA’s expansion into the corridor would serve such major job centers as Emory University and the Centers for Disease Control and Prevention. *Businesses along these thoroughfares will be visited. Throughout the planning process, MARTA’s Clifton Corridor Planning Team will continue to inform and educate various corridor stakeholders by hosting or participating in public forums and community events. For information on the project and schedule of activities, visit www.itsmarta.com/Clifton-Corr.aspx. 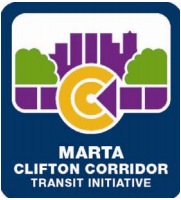 Or, if you need more detail on a specific topic or to request the MARTA Clifton Corridor information tent at your next community event, please contact MARTA by email at Clifton@itsmarta.com.